Contra Costa County Board of Supervisors recently passed new tobacco retailer licensing laws to protect youth from tobacco influences in their communities. eligible to renew their tobacco retailer license after it expires on June 30, 2018 and from then on will be prohibited from selling tobacco products. violation of the law can be fined up to $500 for each day that they are in violation, per County Code 14-12.006. "Administrative fines," and may face suspension or revocation of their tobacco retailer license. Tobacco Retailer License were due July 1, 2017. NEW retailers operating within 1000 feet of schools, parks, playgrounds and libraries are prohibited from selling tobacco products. Existing tobacco retailers are exempt. NEW retailers within 500 feet of tobacco retailers are prohibited from selling tobacco products. Existing tobacco retailers are exempt. No NEW "Significant Tobacco Retailers", including vape shops, hookah bars or smoke shops are allowed. A "Significant Tobacco Retailer" is defined as having more than 20% of retail sales space and display area dedicated to tobacco retailing use. The definition of "tobacco products" and "smoke" have been revised to include all electronic smoking devices and liquids, including all electronic devices that could be used to deliver a dose of nicotine or other substances. The sale of flavored tobacco products, including menthol cigarettes, is prohibited within at least 1,000 feet of schools, parks, playgrounds, and libraries. The sale of cigars, including little cigars and cigarillos, is prohibited in pack sizes under ten (10). Premium cigars that sell for $5.00 or more are exempt from this provision. No tobacco retailer's license will be issued that authorizes tobacco retailing in a pharmacy. Compliance with state and local storefront signage and drug paraphernalia sales laws is required in order to maintain a Contra Costa Tobacco Retailer License. 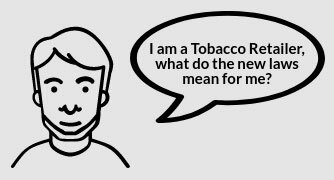 Tobacco retailers are required to check identification (ID) of customers who appear younger than 27 years of age. The number of retailers that can sell tobacco products is "capped" at current number of licenses issued by the County. Tobacco retailers who have their license suspended due to violations of the law are required to remove tobacco advertising during license suspension periods. The time period reviewed for prior violations of the license (the "look-back" period) is expanded from 24 months (2 years) to 60 months (5 years) when considering the length of time for a license suspension for retailers found to be in violation of the law. Online Training: Stop Tobacco Sales to Youth: California Retailers and Youth Tobacco Laws - Coming Soon!